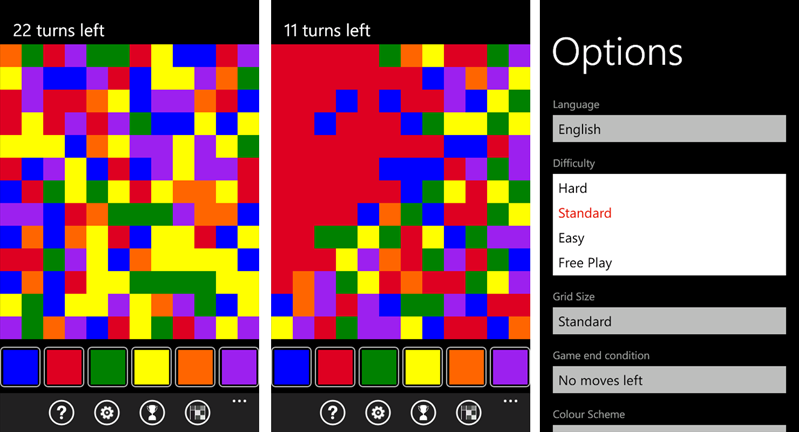 Pixelated is a popular Blackberry game that has migrated to the Windows Phone Store. Pixelated is an interesting game where you have a limited number of moves to eliminate the pixelation on the screen and create a solid color. It's not a difficult game to get a handle on but with the limited moves, it can be rather challenging. Pixelated's game screen has the pixelated color pattern (your game board) with colored tiles lining the bottom of the screen. Button controls are present to access the Help screen, Pixelated options, your game stats, and the developer's About page. Game options cover language, difficulty levels, grid size, color scheme, and layout options. Game stats cover your best scores, win percentage, and achievements earned (there are fifteen of them). Game play is simple. You start with the square pixel in the upper left corner of the playing board. You tap a tile color of any adjacent pixels to change the colors and combine the pixels. Continue the process until all of the pixels are combined, turning the game board into a solid color. Sound easy, right? The challenge comes into play with the limited number of turns you have to combine all the pixels. The number is based on the difficulty level (e.g. Standard Difficulty gives you 22 moves) and you receive no credit for pixels left over. 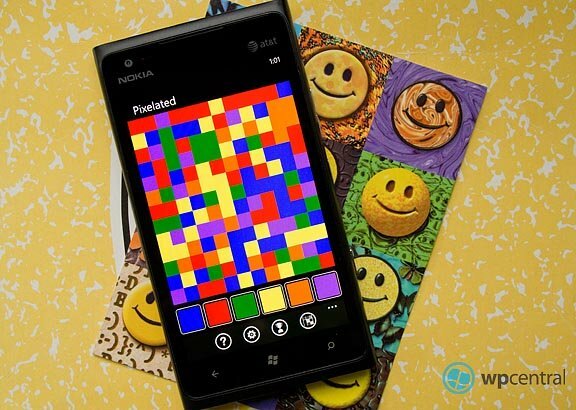 Pixelated is a fun, simple, yet challenging game for your Windows Phone. It's a decent time waster of a game. I couldn't help but think a back or undo button would come in handy to let you get back on course to finish the game without having to start from scratch. There is a free trial available to let you give Pixelated a test drive but it is limited (you can only play the Standard Difficulty and stats aren't collected). The full version of Pixelated is running $2.99 and you can grab it all here at the Windows Phone Store. Thanks, Eric, for the tip!